Before developing a presentation you need to know your audience – what is the baseline for their current understanding of your topic. Try to determine what level of competence the audience possesses because it will have an impact on how you structure and deliver your presentation. I remember once when I was a staff accountant one of the senior managers was trying to explain a complicated concept to me. I just couldn’t quite grasp what he was talking about. My technical knowledge was not at his level, and he was not communicating with me at a level of my understanding. Both of us left that conversation frustrated. 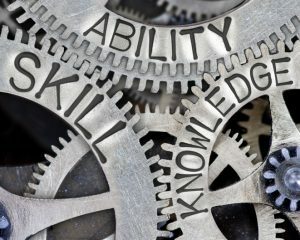 Development of the four stages of competence occurred in the 1970s at Gordon Training International, a well-respected education and training consultancy. As a point of reference, this competency model has been attributed to Abraham Maslow but has not been found in any of his work. Unconscious Incompetence: The person doesn’t know what they don’t know, you know. An example of this is a new employee who recently graduated from university with a degree in accounting. They may have taken an auditing class, but they don’t know how to audit. They may have taken a taxation course, but they do not know how to fill out a tax form. The person just doesn’t recognize that there is a gap between what they know and what they need to know. The only way to move to the next level is for them to recognize their incompetence to the skill and have the desire to acquire the knowledge to master it. Conscious Incompetence: When someone begins to increase their standard of competence through repetition and practice, they move into the Conscious Incompetence quadrant. They know that making mistakes and errors are integral to this learning process. For example, the new associate is learning about the auditing process by learning how to reconcile bank statements and receive feedback on their work. Feedback is critical to the learning process but when taken too personally can bruise some egos. That can create a negative mindset if not presented properly. It is the responsibility of the supervisor to deliver feedback in a positive light to avoid the negative mindset. Conscious Competence: Now the individual begins to have a deeper understanding of the skill necessary and can execute it with minimal errors. They have acquired the skills to be competent in their current role and have shown the ability to continue learning. It’s at this level where they may be a candidate for promotion. In the advancement process, part of the individual’s skill will revert to the unconscious incompetence. Perhaps they are promoted on their increased technical knowledge but are still lacking the skills to manage a group of people. They don’t know what they don’t know. From previous experience, they should recognize this new knowledge gap and begin the process of closing it. Mastering each knowledge gap will help them accelerate to the next level. Unconscious Competence They made it! At this level, the person has extensive exposure to multiple facets of the business and, through practice, the skills needed to succeed are second nature to them. I tend to equate this to the job positions of chief financial officer, a partner in a firm or chief executive officer. With extensive depth and breadth of knowledge, solving issues becomes more intuitive. The lessons learned along the way are a point of reference for finding solutions. Here’s another example I like to use: a golfer. The unconscious competence golfer is the one who is currently on the PGA or LPGA tour. They don’t have to think about the basics of golf: stance, grip, swing, etc. They visualize the shot, consider all variables than just swing the golf club with perfect tempo and rhythm, hitting the ball almost to perfection. Well, most of the time. They maintain this level of excellence with consistent practice, and that is the key to remaining unconsciously competent. Without regular practice, the person will drop back to the third stage. Understanding your audience’s level of competence allows you to tailor your presentation to meet or slightly exceed the audience’s level of expertise. That alignment of what they know and what you are sharing allows you to create a conversation with the audience. When you connect with the group they are more likely to retain your message and be able to act on it. However, if we are talking about complex issues that the audience cannot relate to them, all we are doing is just talking over their heads. We’ve all been in presentations where the presenter delivers highly technical information, using insider jargon and unrecognizable acronyms. The audience has deer-in-the-headlights looks, and are not engaged with the speaker, let alone having a conversation. Tailor your presentations to meet the competency level of the learner. If you talk about any issues that the audience does not relate to, all you are doing is talking over their heads. You’ll have greater success in connecting with them and raising their level of retention.